Each of the 13 rooms offers a unique setting, inviting guests to return time after time. Pets are not permitted inside the hotel. Remember your grandmother’s attic or that favorite bedroom at the lake? You’ll be inn-spired by this roomy but cozy retreat. Ample room for its king bed and two twins, this room is full of natural light and looks out over the White River. A very large bath includes a heated floor and opens into a separate dressing room area. A great option for a family or girlfriends’ retreat. Built around its river rock fireplace, Room 6 has an inn-tentional lodge-like aura. It houses a king size bed with leather headboard and an iron daybed. Its small sitting room is the perfect spot for an early morning read. Handmade Rookwood tiles in an acorn motif adorn the bathroom vanity backsplash. Bright white and blue meets funky old and new in this favorite room of the Butler University fans. 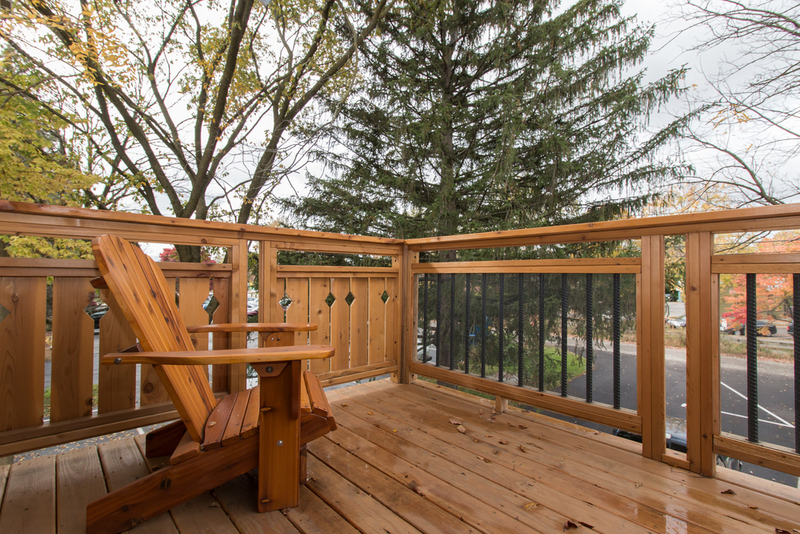 Enjoy the inn-viting views of the Monon Trail from your private deck in this first level room with King bed. Features very generous bath and walk-in shower. Perhaps the coziest guestroom in the hotel. Enjoy a queen size bed with lovely leather headboard or nestle into the inn-timate daybed alcove with a good book. Great people watching from your spacious private deck.